After a weekend that saw No. 1 Georgia and No. 3 Notre Dame fall, the Wisconsin Badgers moved up the No. 5 slot in the latest CFB Playoff rankings. Ahead of them, for now, are two one-loss teams, No. 2 Clemson and No. 4 Oklahoma. Wisconsin and Big Ten fans likely see this as a slight. The Badgers are an undefeated team from a major conference. Shouldn’t they be getting more respect than this? The easy answer would be to say yes, but when you look at their schedule it is not hard to see why they aren’t in the top four. They haven’t played anyone. They got their first win over a ranked team last weekend (then-No. 20 Iowa), but otherwise haven’t played anyone of national consequence. An argument could be made that their schedule is so unimpressive, they shouldn’t be ranked as high as they are. Being undefeated is great, but who cares when all you’ve done is beaten up on the easy competition? That is the argument many are going to make when the CFB Playoff Committee meets to decide who the Final Four is in a few weeks. Should Wisconsin still be undefeated, there will be a strong push to include them in the top four. At that point, they’ll have wins over three ranked teams, Iowa, Michigan, and probably Ohio State (or whoever they play in the Big Ten Championship). Does that mean they should be in over Oklahoma? The Sooners will have wins over four higher ranked teams. But either Clemson or Miami will get knocked out when one loses to the other in the ACC Championship Game. Shouldn’t Wisconsin get that spot? But what if Auburn wins out? Yes, they have two losses, but they’ll have wins over four ranked teams including two No. 1’s (Mississippi State, Georgia, Alabama, and Georgia again in the SEC Championship Game). Can such an accomplishment be denied? Most would say no, but those who think an undefeated Big Ten Champion is more impressive will say yes. If Michigan could do us all a favor and beat the Badgers this week, then this whole potential mess will just go away. No one will care about the Badgers once they lose a game. Michigan was not a great passing team with Wilton Speight. They didn’t get any better when he became injured and John O’Korn took over. While Brandon Peters has completed a higher percentage of passes than either, in three starts he’s only passed or 329 yards. Why so few? Because someone the run game has managed to go from pretty good to borderline unstoppable. They only ran for 160 yards against Maryland, but they gashed Minnesota for 371 yards and Rutgers for 334. Of course, it helps that neither of the three are great at stopping the run. Wisconsin, according to the stats, doesn’t have that problem. The Badgers have the No. 1 overall defense (247.6 yards/game allowed), No. 1 run defense (81.5 yards/game allowed), and the No. 3 scoring defense (13.4 points/game allowed). Then again, the Badgers have obtained their lofty status by beating up on some of the worst rushing teams in the country. The best they’ve faced so far is Maryland (No. 58; 173.3 yards/game). If they are able to slow the Wolverines down, they will still need to score some points themselves. That will not be easy. Like Michigan, they are somewhat one-dimensional on offense. Jonathan Taylor is one of the best running backs in the country. But he’ll have his work cut out for him against Michigan’s ninth-ranked run defense. The question could become whether Wisconsin quarterback Alex Hornibrook can do enough in the passing game to give his team an edge. Wisconsin has some good players, but they have not been tested this season at all. But come Saturday, they will face a real test against the Wolverines. Michigan, on the other hand, is as battle-tested as they come having faced Penn State, Michigan State, and Florida (when they had their act together). That experience will give the Wolverines a slight edge when it comes to dealing with the adversity of what is undoubtedly going to be a very tough game. 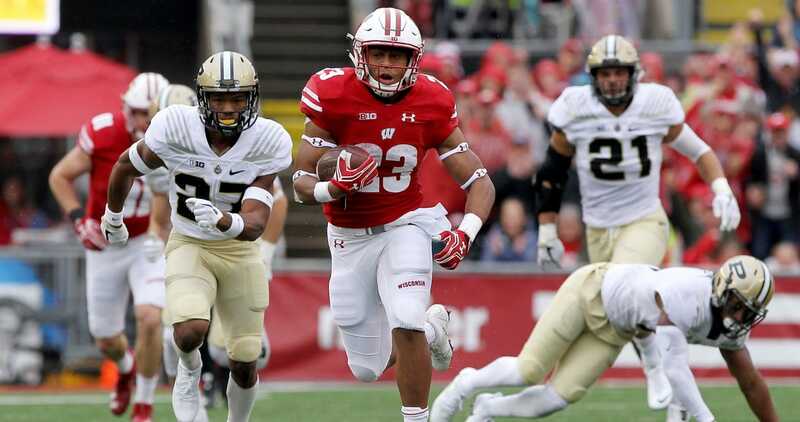 Oddsmakers have made Wisconsin a 7.5-point favorite, but don’t expect the Badgers to slow down the Michigan run game very much. The Wisconsin front is good, but not that good. Take Michigan and the points.